Then, I sat down to read the chapters I had abandoned. But wait– they had been read! I even highlighted them. Rereading, I do remember the content of “Recovering a Sense of Compassion,” but I never really felt the words. So today, I make my effort. To go through and re-read (again) with a pencil, paper, and a clear mind. To have an awareness of potential blockages that keep me from hearing the truth. And here, I share that. 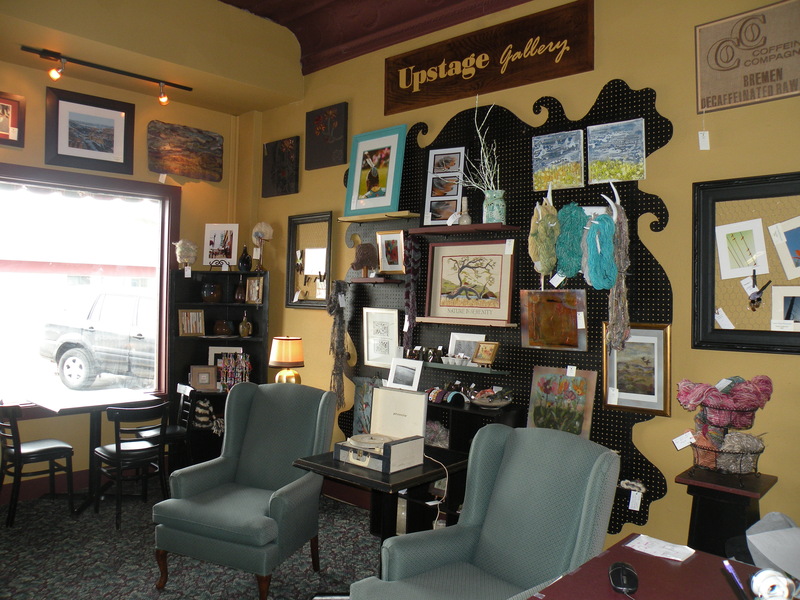 When I first started with the project of opening the Upstage Gallery with Dakota Prairie Regional Center for the Arts, I was absolutely petrified with fear. After the initial meeting, I wrote to a friend, “I find myself feeling very nervous about this and it took me a little to figure out why– I think it has to do with the collaborative aspect of the project and the fact that it is the first “long-term” commitment I’ve made in a long time. I just find myself terrified that I’m going to let folks down. I realize though that these are old dysfunctional feelings…” That was 10 weeks ago. That fear is no longer there, in that way. I was delighted by that collaboration in the project and we had a quite successful soft opening, with the grand opening coming soon. We have work from 15 artists consigned and the list is growing. There has been no disappointment, only enthusiasm and support. Artworks on display at DPRCA Upstage Gallery. This is the first long-term project I’ve been involved in since I left my day job in July 2012. This is not to say that fear has gone away completely. It has moved, to a more private sphere of life. Fear permeates me as I prepare my work for display. Even as I encourage artists young and old to honor the value of their works, I have trouble doing the same. The need to be a great artist makes it hard to be an artist. The need to produce a great work of art, makes it hard to produce any art at all. And months ago, I made a vow to stop using the excuse- “I’ve been so busy.” So when one of my collaborators asked, “What about your jewelry? Where’s that at?” I told the truth, “I’m working on it.” And that night I did. 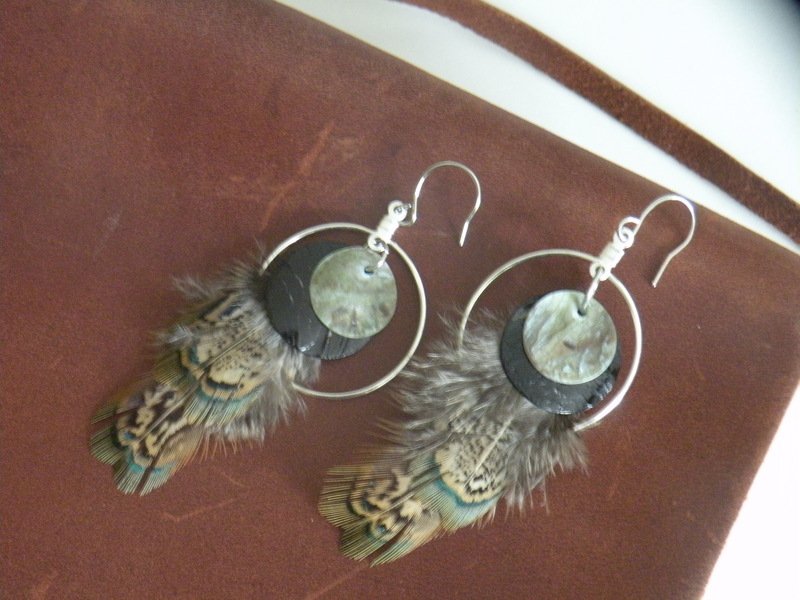 I prepared enough feathers for 12 pairs of earrings. Then the next day, I completed 7 pairs for the gallery and took them in right away. It is part of my habit to silence my critic, to take in my work for consignment nearly immediately. As soon as it is framed, finished, complete, I take it in so there is no room for self-doubt and fear to grow. Once it is on the wall, it is part of the display. But, yet the fear still hangs on as I have pastel drawings in my studio, waiting to be sprayed with fixative, mounted, framed, priced, and consigned. Enthusiasm is not an emotional state. It is a spiritual commitment, a loving surrender to our creative process, and loving recognition off all the creativity around us. And for me, there is so much truth here. I have a terrible tendency to curb my enthusiasm. If I start to get too excited, too giddy, I see it as a sign of irresponsibility on my part. If I don’t curb it, I get scattered. I’m flying high, but I lose my keys, break my glasses, forget to pay the electric bill. I realize now that my curbing my enthusiasm and maintaining my sense of a responsible self, that I let fear continue to have influence in my life. I am fortunate though, that sometimes I just can’t help it- genuine collaboration breaks down that ill-suited defense against enthusiasm. Enthusiasm (from the Greek, “filled with God”) is an ongoing energy supply tapped into the flow of life itself. Enthusiasm is grounded in play, not work. Far from being a brain-numbed soldier, our artist is actually our child within, our inner playmate. As with all playmates, it is joy, not duty, that makes for a lasting bond. This explanation of enthusiasm is so key for me and my recovery as a work addict. Enthusiasm is NOT about work. It is about play. It is about JOY. And with a wonderful group of collaborators to experience the joy of creation with, no longer should I confuse joy and responsibility. Yes, the two can co-exist, and they can be found within one another– but they are not equal. They do not look the same. They do not feel the same. There are differences to be celebrated in both joy and responsibility. As I reach this section of the book, it is overly highlighted. It looks like an undergraduate textbook. I’m sure I understood it, I must have recognized myself in it. But it is the sections that I didn’t highlight that are most revealing. A productive artist is quite often a happy person. This can be very threatening as a self-concept to those who are used to getting their needs met by being unhappy. This is one phrase that wasn’t highlighted. Even now, in rereading I looked over it. Initially, it didn’t resonate with me. “That must be for someone else,” I thought. But, no. There is startling truth in it. While the statement feels like someone saying, “Oh, you’re just unhappy to get attention…” the truth in it has more to do with the fact that dysfunctional patterns of life lead us to do things in unhealthy ways. For me, I was most productive when I was unhappy. Whether I was physically not well, emotionally scarred, grieving loss, hiding anger, or just simply not quite okay with things– that is when I excelled— as a student, as an artist, as a waitress, as a grant writer, as someone striving to be the best THE ABSOLUTE BEST they could be, just to drown out the unhappiness. In this pattern, I got graded well, recognized, tipped, funded, and promoted. I got my needs met. So yes, now doing art simply out of joy!? Writing for the creative endeavor of it!? It seems so foreign! This is my creative u-turn. Healthy creativity. Finding support. Nourishing myself. Respecting myself. Honoring my work. Letting enthusiasm drive away the fear. Now I remember! I do, I do! In order to work freely on a project, an artist must be at least functionally free of resentment (anger) and resistance (fear). What do we mean by that? We mean that any buried barriers must be aired before the work can proceed. The same holds true for any buried payoffs to not working. Blocks are seldom mysterious. They are, instead, recognizable artistic defenses against what is perceived (rightly or wrongly) as a hostile environment. 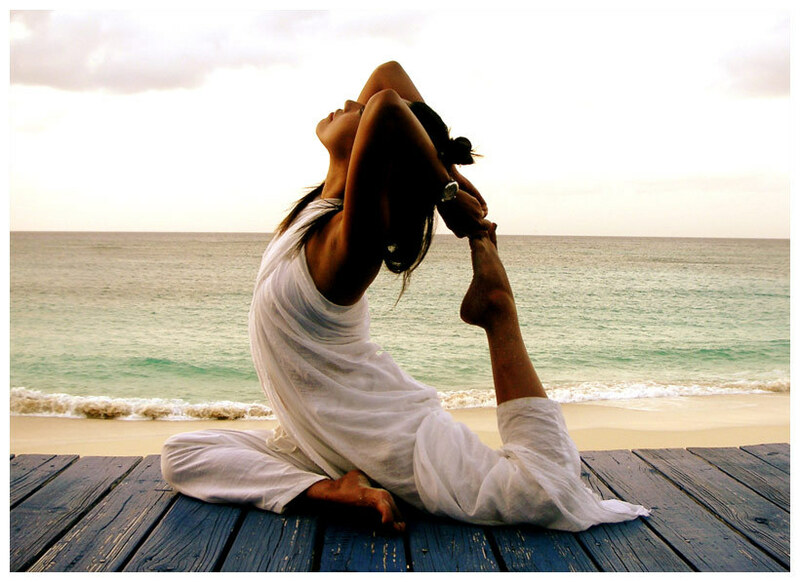 Her suggestions to do backbends like Camel, Cobra, and Upward Bow, and the kneeling arm sequence (Mudhra bind, Reverse Prayer, Half Eagle, and Half Cow Face) to open the collarbones and extend the spine were followed by opening my hips. She said “it will free emotions and may lead to a sudden overwhelming rush of feeling, but it will help you work through them faster. These are poses like Garland and High Lunge, Wide-Legged Seated Forward Bend, and One-Legged King Pigeon I.” Then, after feeling better I tried an inversion like Downward Dog, Standing Split, Wide-Legged Forward Bend, or even Big Toe. It worked marvelously. I felt so much better, but physical pain still remained in one particular spot. Physically, meta-physically, whatever, however it works out, that pain became a block for me and I never followed up on the rest of this chapter. So hear I am, reading the notes I made, with an awareness that detects the anger still there and hoping to break the cycle that consumed me before. Cameron asks a lot of questions of her readers. 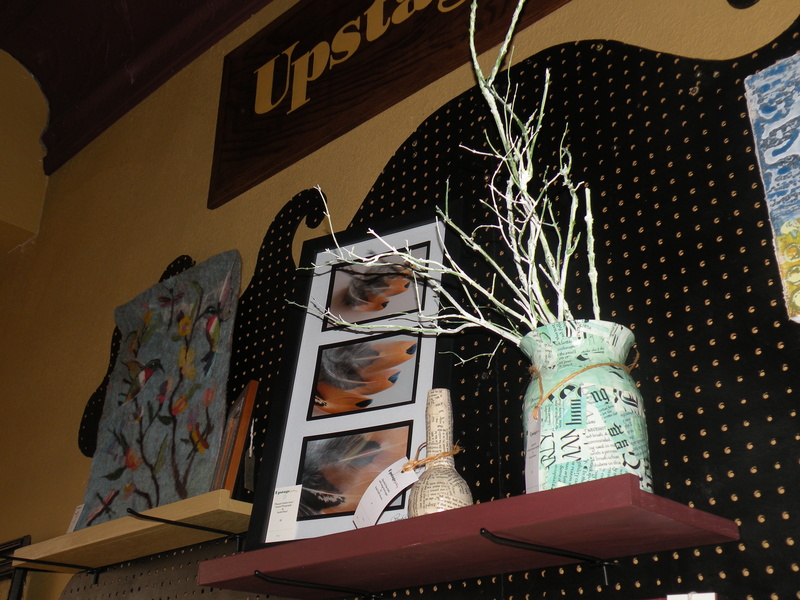 I wrote about my involvement as a consigned artist at Upstage Gallery. having let the process of creating artwork go, earlier in my life. feeling an expectation to have some of my work (but not too much) as the gallery manager. feeling intimidated or superior to other artwork I see. not having the space, time, money, or energy to do the work I want. I’m afraid the work won’t be good, or won’t be presented as good as it should. I’m afraid people will love it and come to expect things of me. I’m afraid I will be judged. I’m afraid it will be too expensive for others to buy- that I’ll be at a loss. I’m afraid I will have to talk about my work with others who won’t really understand. I’m afraid I will have to defend myself, my philosophies, and my methods. Am I afraid of having things on display? Showing myself to the world? Afraid I’ll be made a fool? Afraid I’ll have to make commitments that I’m not comfortable with? Afraid I’ll have to face the old feelings that I once hid from with art? Afraid I’ll have to face the feelings that led me to stop doing my art? How strange it is, to go back to these notes I made! To see how deep the fear is… the fear that being an artist will force me to accept myself and my past. How strange it is, to see it all as a learning process. How strange it is, to see that I’ve been here before. Days ago, weeks ago, years ago. How strange it is, to move on, to move into it. And to understand that compassion can be a guide, as we move on, move into, and move through the world. Posted in Appreciating the Moment, Recovering the Artist Within, Redefining Work and tagged addictions, art, breathing, creative, emotional, joy, learning, philosophy, reading, recovery, work addiction, writing. Bookmark the permalink.